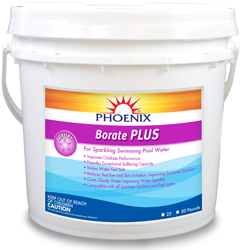 Phoenix Borate Plus 25/50lb and alb - Phoenix Products Co.Phoenix Products Co.
Use for Sparkling Pool Water. Formulated to enhance water quality and clear cloudy water which is caused by algae or bacteria, poor water balance, and fine dirt particles. Is proven to reduce red eye and skin irritation producing softer feeling skin. Improves oxidizer performance while providing exceptional buffering capacity. Cures cloudy water and improves water sparkle. Compatible with all sanitizer systems and pool types. Compatible with all sanitizer and pool types.